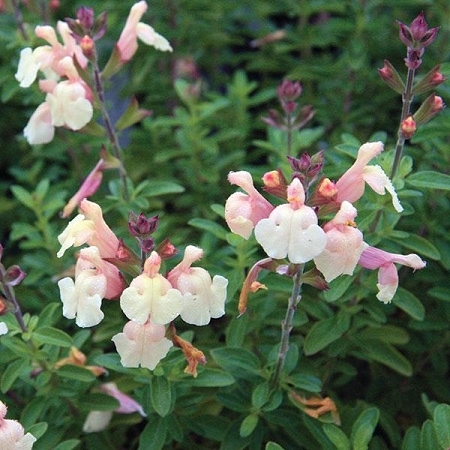 Suncrest Golden Girl Salvia (salvia greggii "suncrest golden girl") PP23,997 Beautiful salvia from the Suncrest series has an unusual bloom color of golden yellow with a peach/beige blush. Like other salvia, is drought tolerant once established and will entice hummingbirds and other pollinators to your garden. Easy to grow perennial tolerant of poor soils and reportedly deer resistant. Blooms Spring through Fall. Forms a small bush approx. 3' x 3'. Perennial Zones 7-11. One starter plant in 3 inch container.